In the late 1990s, after eight years working at Microsoft Corporation, my wife and I found ourselves on the receiving end of a financial windfall that freed us of the burden of nine-to-five jobs. Over time, our interests coalesced around the twin themes of food and community. We came to the realization that our contemporary food system has failed us at almost every level and that we need to work together with our community to imagine a new culture of food that is both abundant and resilient. Inspired by the burgeoning Slow Money movement, we decided to dedicate our time, knowledge and financial resources to this effort. We started with values: the health and wellbeing of people and the land, interdependent relationships, strong communities, and a worldview that sees humans as an integral and important part of the natural world. 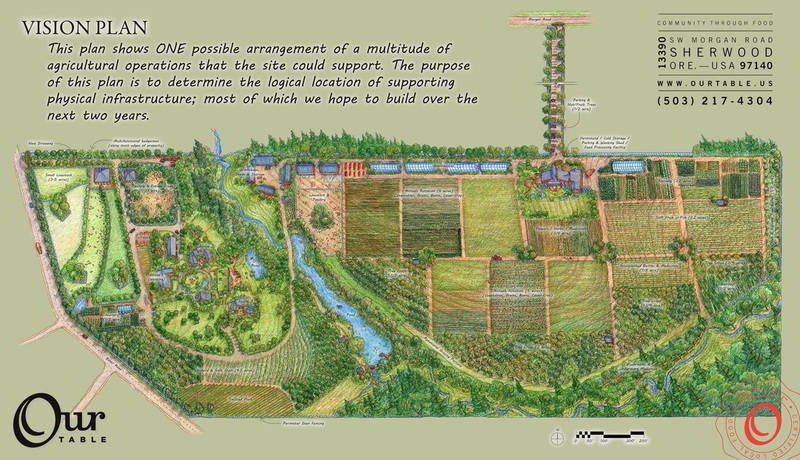 We wanted all the people involved in growing, raising, processing, distributing, cooking, and eating food to have an equal voice and ownership of their food; a model community owned food system in which the farm feeds the community and the community feeds the farm. Since economic and ecological sustainability were both critical, a for-profit structure was important. Our answer is Our Table – a cooperative business with three distinct but interdependent membership groups or classes – workers, regional producers, and consumers. Workers, from farmers to the delivery drivers, operate the cooperative’s farm and manage the organization. Producers are independent farmers and food artisans who grow and produce all the things that we want to eat but do not grow on our own farm. Consumers are the people who eat the food, which includes all of us in the community. 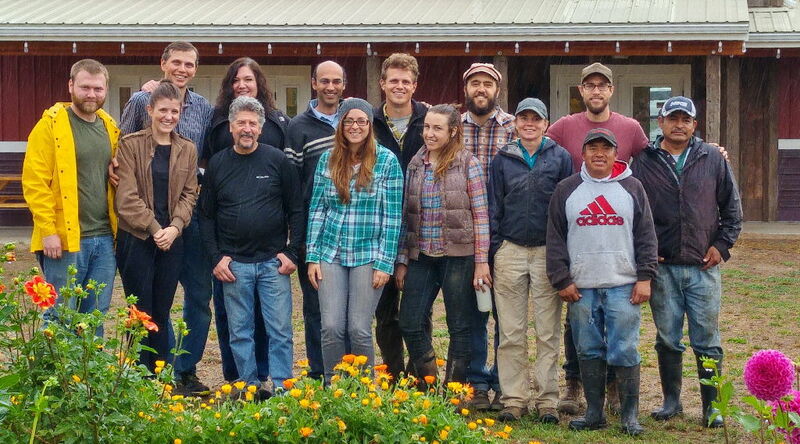 The Cooperative brings this diverse group of stakeholders together to the proverbial table to solve a common problem, and collectively, its members own and control the business and share the profits. Since 2013, we have been raising a diverse array of vegetables, fruit and animal products on our 60-acre farm located just 15 miles from downtown Portland. Combined with products from our regional producer members, this allows us to offer a full-diet of Oregon-sourced and organic foods. Our on-farm commercial kitchen produces everything from jams and jellies to soups and lasagnas. All of this is available via a CSA program as well as in our on-farm full-service grocery store. The store is our primary retail outlet and the only farm-direct healthy food source for our middle-class suburban community. With 16 employees and over 200 members, our gross revenues have grown to over $550,000 in 2015. However, this ambitious undertaking is not profitable yet and to date, financing from Slow Money inspired investors has provided crucial operating capital in the form of preferred stock. We hope to achieve profitability in two years with $1.2m in revenues and 800 members. We are currently trying to raise an additional $350,000 as we work towards this goal of financial self-sufficiency by 2017. Over a few short years, we have overcome numerous challenges but continue to grapple with many more. Organic farming is a particularly risky business and the proverbial vagaries of nature are always rearing their ugly heads. However, the actual growing of food in a sustainable way is a complex but ultimately manageable problem. The more intractable issue is, at some level, far simpler – us: people; culture. On a day-to-day basis, what inspires me most is people; the individuals who work here and the members of our community who engage with us in myriad ways. On the flip side, the biggest single barrier to achieving our vision of a resilient and interdependent local food culture is the prevailing culture! Our society does not place a great deal of value on the people involved in producing our food. The supreme irony of our business is that most of our workers cannot afford to purchase the food we produce! This is not because our food is over-priced. On the contrary, over 70% of our costs go towards payroll — at wage levels that are too low for comfort. The real reason most of us cannot afford our own food is because in our society, food is grossly underpriced. The true cost of production is not reflected in majority of what we eat today because a large percentage of this cost is offset in space and/or time. We import much of our food from faraway places where labor is cheap and, at home, we rely on migrant labor often working in near slavery conditions. At the same time, our farming practices destroy the soil, pollute our water, sicken our farmers, and decimate rural communities. As much as each of us may, at an individual level, abhor these practices and their effects, we all bear a collective responsibility for them; it is our cultural values that create the system that results in these behaviors. In contrast, at Our Table we make every attempt to price our food at what it truly costs to produce right here in our community, in a sustainable and closed-loop way. The result is that too many people in our community, including our own workers, find it difficult to purchase this appropriately priced food. The solution to this is not to make food cheaper by hiding costs but to change the value systems at the foundation of modern society. Obviously, none of us can undertake this herculean task alone. Certainly, none of us have all the answers. However, our society is a human invention – a figment of our collective imagination and if we act collectively, there is nothing to stop us from imagining and creating something different. Our real task is to change the culture and the only way to do that is to change ourselves. As someone once said to me rather ominously, “it is time to unwind the hypocrisy of our lives!” Farmers intuitively understand that when stewarded with love and care, nature produces a bounty and abundance that epitomizes the concept of the whole being greater than the sum of its parts. We are a part of a larger whole, and coming together to collectively address common problems is a defining feature of what it means to be human. Pope Francis recently wrote that “we human beings are part of the environment. We live in communion with it”. It is in this spirit of communion, love, and collective effort that we come together at Our Table. Workers, producers, consumers, and investors – the entire community – to take ownership of our food and change our culture.